I know I said I would continue writing. I didn't mean to take a month. But things have been happening. Yeah, I hear those quizzical grunts. I'm the new geology technician at, actually, my old university (Pomona College - for you foreigners, college out here is the same as university, and this is quite a good one despite the fact that not many people have heard of it). 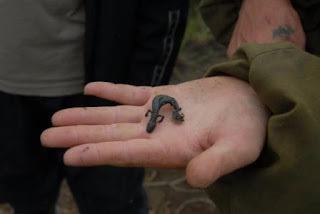 And yes, I know I've never really talked about geology extensively before, because yes, I'm a photographer- ecologist- journalist- healthcare researching- animal wrangler, not a geologist. But who cares about all that! I can be a geologist if I want to! And so it is written, and so it is done. Most of what I do involves running the department, from managing all the technology (XRD, laser particle analyzer, rock saw, computers) to being a web editor to being driver/cook/manual labor/babysitter on field trips. Its varied enough to keep me interested, the department has a lot of good people, and I get to learn stuff. Ugh, I know. Well, my new place is nice, I live in the garage of a nice house. Just kidding! Or not, actually, I DO live in the garage, but in an awesome extra room with a LOFT, which is the most fantastic place to sleep ever. Its like living in a tree house. A ridiculously hot treehouse, however, as its been 100F (39C) more often than not the last few weeks. So, here's the plan. I'm going to be working here for a year. Then I'll either go to grad school or get myself to Antarctica. Now, my creepy website-stalking program is telling me people still visit this site, so I guess I have a good reason to keep writing. But now the theme will revolve around the wild and crazy world of GEOLOGYYYY EDUCATIONNNNN! It's good to be settled. Now I just need a social life. I'm still wondering where the line is for sketchy old alumna/staff hanging out with students. I mean, they are basically my age, but I'm supposed to be a professional now. And stuff. Yah! Those were fun to wake up to in Canada, when I noticed my skin coming off! Now, I've gotten blisters on my feet maybe...maybe twice in my life before, and not for lack of trying. I simply do not blister. (Incidentally, I've never gotten poison oak before either, which seems a rather extraordinary stroke of luck that makes me believe I may be immune). So, seeing those puppies was actually sort of terrifying. Now...technically that bed is about an inch of foam covering a sheet of plywood, which is really more comfortable than it sounds. Laying on there diagonally I just about fit. Speaking of that, I've got an announcement for America: TALL PEOPLE ARE PEOPLE TOO. Walking around foreign countries, I expect to get started at, for whatever reason that might make me look unusual. But my god, people here at home are ruder than I remember. Who runs up to people and says, "You're really tall!" Uh, thanks for the news flash? What sort of training do American's get as kids that slack-jawed stares and idiotic comments are the first response for people of unusual size? My family is perfectly proportional but sometimes it feels like going into town together is like putting on a show, let alone when there's just one or two of us walking around. (I think I've brought this up before, but I'm 6'3", and my family is sized around that, my bro and dad signficantly taller than me and my mom slightly shorter). Oh, and here's a good one! People that walk past you then IMMEDIATELY start going on about "Good christ did you see how tall they were!" We're not deaf! Somehow I'm oddly reminded of a VERY odd experience I had my first time in London, coming home from Norway two years ago. I had to spend the night in a hotel and took the tubes to get there with my massive amounts of luggage. Exhausted, I ended up on a train seat next to a man who, after staring at my arm for five minutes, said "You have realllllly nice skin." Well there's my little rough-transition rant. But that business is nothing new. As for otherwise in this coming home transition, things haven't gone all that bad. I'm still having a hard time with how much food there is here - not even in a "American glutenous" way, but just coming to terms with the fact that I don't constantly have to strategize where my next meal is coming from, and I can eat until I'm full. I wake up almost instantly. I know exactly where this comes from - living with the Canadian coast guard and our wicked sampling schedules. That was alarm rings BOOM dressed fully conscious in about 5 minutes, ready to go haul and filter water for the next 6 hours. 2am or 6pm or noon, gotta be ready to go. I've been horribly spoiled by freedom. My internal tolerance for boredom has become slim. I'm reminded of a small tantrum I threw in the Norwegian hospital, a few hours after my second surgery (no one saw it, I do have some measure of pride): the nurses pushed my bed from the emergency ward out to radiology (I wasn't allowed to get up yet), where I was left for about 30 minutes by myself. Sick of the entire scenario, I began singing "bored bored bored" to myself and used my hands against the wall to push my bed up and down the hallway. There is a very significant chance that that was the drugs talking at that point in time. There are a great deal of people that I need to thank for everything thats happened this year. And for everyone who made this impossible year happen. Well, I guess I dropped the ball with the blog. Just because I'm not doing something fantastically exciting anymore doesn't mean I'm going to stop writing...although I imagine my readership will drastically decrease. I will say this - it shouldn't be long before I start doing something else ridiculous, so if you're interested in that sort of thing, I recommend checking up here periodically to see where I've flown myself. I've been in California for about a week now, and the Mexican food is as beautiful as I remembered, as is the Jamba Juice. My arrival in LAX was only slightly marred by my ONLY luggage mishap of the year - and a fairly minor one at that. They managed to send my camera gear to the wrong part of the terminal. It is miraculous that my luggage and flights this year have all essentially been made intact. The week began with a slew of doctor's appointments, luckily curing me of my Siberian deafness (yeeeah...I had lost my hearing in one ear, but no worries, we're good now) but unfortunately not killing the everlasting pain in my foot. It seems heat makes it significantly worse, rather than better. Ah well. The weekend was spent in Claremont, home of my alma mater, attending the Watson conference. Essentially, a bunch of brilliant amazing people gathered in a shell-shocked mass to talk about their utterly priceless years while attempting to empathize with 50 other people who did equally insane, yet totally different things. AWK-WARD! I kid, it was awesome, there was free food. But especially after Siberia, I'll be honest - I don't really deal well with people yet. One on one I can do, and nameless crowds are ok, but constant cheerful chattering and smiling...not so much. Ergh, that doesn't sound so nice, I'm sorry. I'm actually liking it here better than I thought I would. I've just never been the socialable one. And then theres my consistent shock to overhear people speaking English. I'm starting to learn how to drive again (it was only a little...eh...the first time). After getting back from the conference, I took myself to the beach on a cloudy day, fell asleep, and promptly earned myself one of the worst sunburns I've ever had in a long, painful history of horrible sunburns. My skin really was built for northern fashions. I seem to exist in a permanent state of red now. Not attractive, but just wait for the itchy flaking leper stage. WELL, on that note, let me apologies again for not emailing/calling/blogging anyone and everyone that I was so excited to be able to contact again. I seem to have lost the ability to communicate to anyone not within 5 feet of me. Are you wondering what wonderful thing I will do next? That, it would seem, is the question of the hour. A mystery to us all. It is about midnight, the night before I will fly home. I've spent the last few days in Halifax, Canada with my friend Lisa, after arriving safely from Siberia. The trip was intense, although all in all everything ended well. 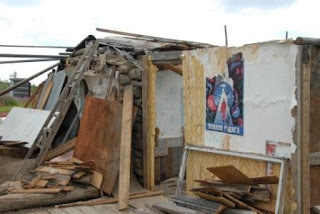 I left Cherskii Tuesday evening, arriving in Yakutsk late that night to find the hotel had no record of my reservation, and no one on duty who spoke English to any useful degree. After awhile, they tried to give me a room for about $300, at which point I mildly flipped out and they woke up a manager to give me whatever I wanted. The next day began an utterly grueling 48 hour journey. The final dregs of my banking account have gone to Mother Russia, in her exorbitant fees to transport my excess luggage. During the first leg, between Yakutsk and Moscow, I realized something: I am tired of traveling. Not forever, but right now, I am tired. Two hours into the flight, I realized I still had four more hours to Moscow, 4 more five-hour flights, and 3 customs officials to fight through. Every time I got on a new plane I turned back my clock, finding myself progressing almost not at all through the day and having no idea what time my body was actually on. I was in disgusting shape by the time I hit Canada. Ever since then I've had a lovely time here. We're gone swimming in the lake everyday, I've got my first sunburn of the year, and I've rediscovered food. But to summarize my pre-home epiphany: this is nice. I am tired of moving. The novelty of flying a bazillion miles to far-away places has worn off. I missed my only brother's high school graduation and all of his senior games. I haven't seen any friends in a year. My foot hurts. I'm ready to be done. But don't let that make you think I haven't enjoyed myself. I wouldn't have traded this year for anything. I'm just glad I've come to terms with going home, even if I have butterflies in my stomach tonight. 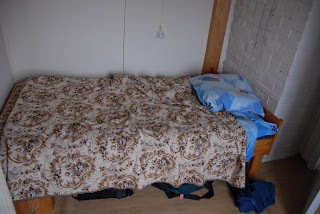 I'm sure I'll be wanting to move on again soon enough, but for now - I'd like a bed thats not a piece of plywood, and to be able to understand what people are saying, and to make friends that I don't have to say goodbye to in three months. People often remark on the bad luck with my foot. I have a hard time saying "bad luck". It's a thing that happens - things happen, especially in this crazy journey. I never thought I'd buy a snowmobile. I never thought I'd live in the shadow of a mountain and not be able to reach the first bouldery plateau. I'll go home with a permanent souvenir of this trip - a three inch bolt in my foot. And when you think about it, how cool is all that, really. Home is a week away. An extremely busy week, but only a week. Bizarre. Tomorrow will begin my next completely ridiculous plane-hopping journey. Although most of the time my traveling agenda meets some semblance of rational thought, this time it does not. I am within a few short hours of Alaska and the western US, but Russian-American relations being what they are, the only way for me to get home is going west, instead of east, literally taking me around the entire world. Well, technically I lie. It is possible to charter a private plane for a few bazillion dollars to get to Alaska. Or I could go through China or Japan for another extraordinary amount of money. 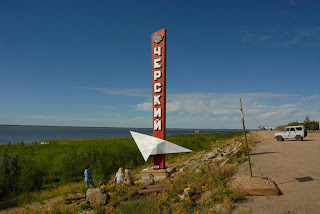 Here’s what I’ll be doing instead: Cherskii, helicopter to Srednekolymsk, sketchy plane to Yakutsk. Yakutsk to Moscow (I did manage to find a direct flight this time), Moscow to London, then to St. John’s (Canada), then to Halifax, then to Toronto, then to Los Angeles. Admittedly, the Halifax bit isn’t 100% necessary, but to stop in Canada for a few days costs exactly the same as to fly only slightly more directly to LA from Moscow. Another 8-stop airplane jaunt, all told! I think 8 is like, my average. If I ever need to do something as simple as fly back and forth across the US it’s going to feel like the easiest thing ever. And that would have things like, signs in English. At least this time I don’t have to stop at the St. Petersburg airport. I don’t think I told this story when I came in. When I landed in St. Petersburg, I assumed I would see some English, as you do in most major international cities. I got off the plane, was heavily scowled at through customs, collected my luggage, and ended up in a tiny lobby. I found a sign that I vaguely understood to be an information stand for passengers with connecting flights, and the little lady inside spoke enough English to tell me that I should wait and someone would come get me to drive me to the airport, which made me wonder where in the world I was if not already at the airport. A few minutes later, a stewardess came and asked if I had another flight, then quickly turned and had me follow her outside. There was a dirty old white van, into which I shoved my luggage with a few other people, and was given the honour of front seat (walking with a cane has its advantages). We took off. 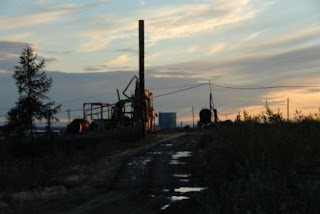 A few minutes later, I realized I was sitting in a dirty old van with 5 Russian men jabbering on their cell phones and nothing whatsoever to reassure me that we were going to the “airport”, particularly as we started to drive through a field. Luckily we did end up at the airport, another terminal which was oddly a 10 minute drive away. There I found no one at all who spoke any English, and no signs in English, and no gate numbers, so the whole experience was decently nerve-wracking. I’ve found vigorously pointing at my ticket and looking confused at least makes people nod if I’m in the right place. Moscow airport felt like heaven after that, so I have higher hopes for the return trip. Inside we packed 11 people around their little kitchen and I listened to a lot of Russian. 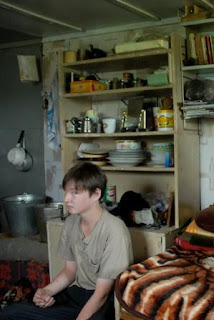 Eventually Sergei Z, who I had been sitting next to, moved to the corner to smoke, and called Marat over to sit next to me: “Marat should talk to you. He needs to practice English and also to talk to girls.” Wow, way to scare the BEJEESUS out of this poor guy, who rather does need practice in both of those things. A few days ago I walked to town at midnight to get some photos. As I was kneeling down to get a photo of an oil tank in the trees, an ENORMOUS dog jumped out and started running towards me. I love the dogs here – all you have to do is act like you’re happy to see them, and they’re your best friend. 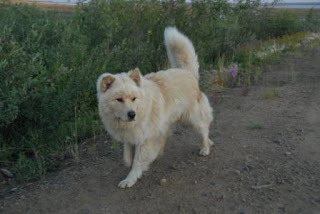 He followed me all around town and even barked at other dogs that tried to get near me. 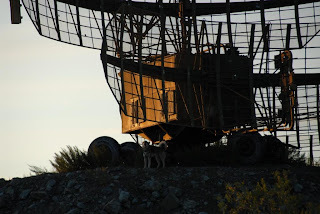 I eventually got to the old military base – you can’t see too much of it from the road, beyond two huge radio arrays, guarded by some howling dogs. (The photo below can actually be clicked to make it bigger, so you can see the dog better). An American taking photos of Russian military equipment at midnight: because that’s not suspicious, or anything. The next day I came back during the day, and to my astonishment the dishes were not abandoned, as I had assumed, but spinning around reading my thoughts or whatever they do. I’m afraid I don’t have too much else to write about. After trying so hard to get into Siberia, its hard to believe I’m leaving already. I never got to see the reindeer herders, which I’m disappointed about, but from talking to the Sergei’s, they rarely see them anyway. I can’t afford to hire a helicopter to take me out over the tundra to find their camp, which is essentially the only way to find them. 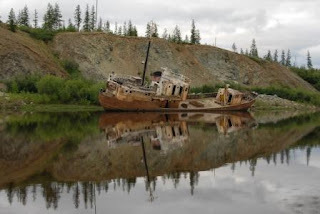 As a nomadic people, they don’t use boats, so even searching along the rivers might not get you anywhere close. All the same, Cherskii has certainly been a fascinating area. I still have a few posts left in me before I get home – I’m sure I’ll have something to say about my flying adventures, and Canada, and my thoughts on going home, and maybe get some more photos out here. But all in all, I think I’m ready. I’m trying not to think too hard about “the end”, which inspires a sort of panic, and there’s plenty to look forward to. 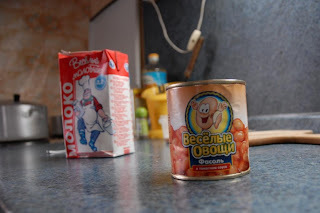 I am so, so sick of canned beans and dirty water. Only a week more in Russia. I think…that’s ok. For the weekly wonderful tales I tell, on a day-to-day basis there’s not really enough to keep me occupied, and with the ever-looming stresses of moving back into the US, it feels time to get there and get it done. Doesn’t mean I’m not TOTALLY FREAKED OUT about moving back, especially after another American friend of mine, recently returned from Norway, commented on how he didn’t like moving back very much at all – and he moved back to the relative calm of Seattle (is it relatively calm there? I guess I just assume LA is the most ridiculous place ever), making me wonder how in the world I’m going to deal with the people of Los Angeles. Although, those that know me better know I don’t actually live in LA at all, but on a farm a bit south of Santa Barbara. Most likely I can handle Ventura. I suppose technically I’m of an age where I don’t live anywhere, but take advantage of my parent’s address while homeless. But I’ll save the throes of my philosophical waxing for a later date, perhaps nicely told in the environs of a panicked airport stopover. I still have a few days in Canada with a friend, which should provide a decent buffer zone to the heat-shock of CA. Back to our present local. There’s been a few small adventures the last weeks, which under the pressure of mild hyperbole should be interesting to write about. When the birder’s were still here, they told me that there was a small lake about 10 minutes walk up the road, which I hadn’t seen before. So I decided to go have a look. About 20 minutes down the road, no lake. I felt like an idiot. Can’t find a lake. So I continued on my way, determined to make an interesting walk of it regardless, and ended up walking all the way to town, swerving south to return along the airport and take the coast back home. 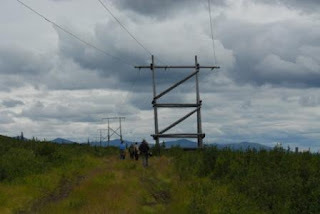 The walk to town is a long dirt road – nothing terribly unusual. 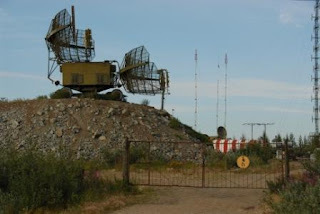 When you turn to the airport, the area is filled with the typical junk of the region – weird bits of machinery, old housing, all sorts of random things. By this point I had only seen 3 people, none of which approached or even hardly looked at me, but I still felt as if I was going somewhere I shouldn’t. I can’t really explain that – just shyness on my part, going somewhere I hadn’t seen before? 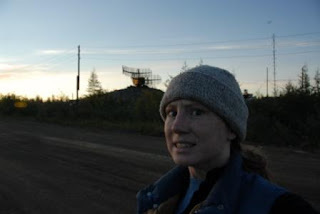 I decided to tough it out and ended up walking through a (currently empty) quarry/construction zone near the airport. The weird thing with these places is that its very hard to tell if they are abandoned or not. I have been scared of out my wits before, coming across piles of random timber that I felt CERTAIN were empty, only to find a family of campers inside. I often wonder how my impression of “Russian-ness” affects what I see. I had a perfectly lovely walk, saw interesting things, gorgeous view of the river. 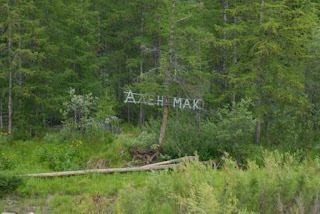 Coming alongside the field of oil tanks, I noticed a thick wall of barbed wire running hap-hazardly through the forest. I had sudden visions of the KGB jumping out, confiscating my camera, and sending me to jail for eternity. Probably the most ridiculous unlikelihood ever, but I completed my walk as silently as possible. So I, in my infinite wisdom, decided to climb it. Luckily, the popularity of concrete and rebar ensured that the old building wasn’t about to immediately collapse, and I got up to the base of the dish before losing my nerve to my intense fear of heights. (Ironic, I know.) The building was locked up, but I was given an impressive view. Although the building was in disrepair, the dish looks in too good of condition to be abandoned, and I hope they can fix it up. Later in the week I decided I was going to find that lake. As it turns out, I was supposed to turn off a tiny dirt road/path, which I had not done before due to the presence of a large house on the path. Being more inclined to not be shot for trespassing than to find a lake, I had ignored it the first time, but this time was assured that the house was abandoned. Walking out, I found the house far more fascinating that the potential lake. The building had been coated in a heavy, fuzzy orange foam-material. It was the most bizarre thing, as through someone had sprayed the house down in this…foam, and meant for it to seal the place up. You could see the dim outline of windows and doors under the foam. I didn’t know what to think. Was it merely a method to keep the neighborhood hooligans out? Or was there some kind of…who knows, gas leak, or viral plague, locked up inside? I found a door not covered by orange foam and tried to get inside. Inside THAT door was another heavily padlocked door with a sign written in large Russian letters saying something very firmly with lots of exclamation points. I decided it was time to leave. The lake, although reported to have an accessible Arctic tern nest, was almost completely intolerable due to mosquitoes. The path to the edge, as so many paths in this area, was defined by the trail of completely random garbage, including a baking tray, a car muffler, a bale of wire, and about a million cans of mackerel. Has anyone ever seen “Solaris”? Not the George Clooney one but the original Russian one. I was walking along the river the other day and was very tripped out to see that the surface of the water looked EXACTLY like the surface of the mystery liquid in the original Solaris. Weirrrrd. Another mini-adventure: I took another walk out down our dirt road and turned up another small dirt path. I determined that if I was going to come across someone’s actual home, I could see it far enough in advance to turn away. I did see a building in the distance, but it looked to be abandoned. When I finally reached it, it certainly was – the thin, scarred ravages of large metallic building that had been oddly ripped to shreds. 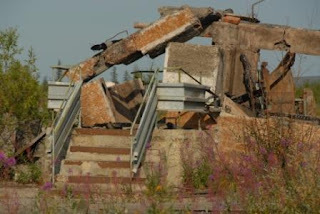 There is something very bizarre about sitting on a hill, in the midst of a massive forest, walking among the remains of destroyed building, as the wind whistles in odd ways off the metal, and the heat of the sun makes the panels pop like foot steps. Small signs of the life that used to be here – a rusted boiler, an ancient “no smoking” sign, patches of molding wallpaper – give a sad life to the place. 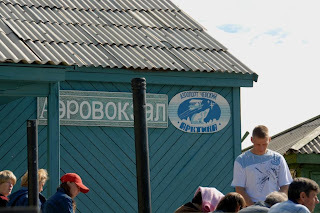 One of the things I had been hoping to learn more about in Cherskii was the gulag that existed here decades ago. 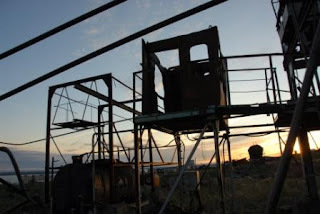 Cherskii was in fact home to one of the most infamous gulags, or work/concentration camps, during the time where prisoners where sent to Siberia to work out their lives and in all likelihood die of cold, starvation, or disease. 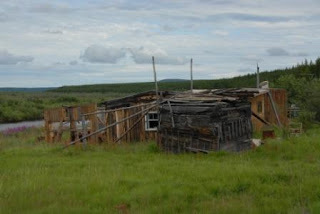 Today, however, there is nothing left of the “gulag” – it is not some huge old building, but rather this location, where small wooden huts would have housed piles of cramped prisoners as they worked in the mines, or in cutting timber, or other hard labor. 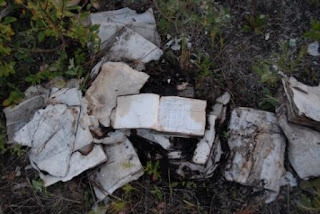 So, while I cannot show anything directly in photographs, I often wonder about the junk I find in the forest – in all likelihood, some amount of it is left over not from the greater days of Cherskii, but the remnants of the gulag station. Two days ago, having been quite restless, I went for a walk at 2am to get some interesting light – “sunrise”, to the nearest sense, as the sun is slightly below the horizon at midnight now. There is nothing exciting to tell about this experience, beyond the calm of that dawn light – the pleasant windless silence, as the sun darts between the trees to the north. It feels like autumn, and home. The weather has been quite strange this week – rain for the last two days straight. Sergei Z’s son is supposed to come today with his wife and fresh baby – Sergei and Gaya’s first grandchild. I wonder if the weather will delay their helicopter. They will move into the house with the computer I use for the internet, so I will not be so free to use it when I please. I hope to send out at least one more Russian post before leaving next Tuesday. I wanted to get this text out before they came, and will try to post photos soon as well, if there is time. Today I worked miracles in the kitchen and the apopcalypse did not occur. Galina hurt her back pretty bad yesterday, to the extent that, to my terror, an ambulance pulled up this morning. Having no clue whatsoever what was going on, I wondered if I was going to lose some signficant percentage of my neighborhood. Luckily the people seemed in no hurry and apparently it was just a house call by the doctor. I'll take this moment to make a small, hm, not exactly complaint, but observation. I've told Galina and everyone about a MILLION times to let me know if they need help with anything, such as, oh, with lifting something heavy that will throw your back out that you should probably let the big twenty-something girl do. But my services go largely unused. Anyway, I decided to make cookies for Gaya (probably spelled wrong, but the nickname for "Galina" is pronounced Guy-a), since they're something I can usually pull off. 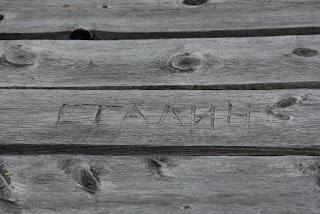 However, I failed to consider that it being Siberia, I lacked about 50% of the ingediants. With eggs and butter already mixed, I used the power of my mind to determine the rest. Sugar is sugar, so no need for brown sugar, and vanilla essense is basically like, a spice, right? So is cinnamon. So vanilla essense is just cinnamon. And since I don't even know what baking powder technically is, it can't be all that important. A hammer and a chocolate bar made chocolate chips, some rough math figured out the celcius stove, and to my utmost surprise, I made edible Siberian cookies from butter which came from an unknown animal. In proper news, there's been some pretty exciting things going on, science-wise! In my region of the world, the best-preserved mammoth ever discovered was recently unearthed, renewing hopes for cloning. Read about it here! In other crazy animal news, on one of the creatures I like to recognize when it comes up, check out this giant squid that washed up! Here! Slightly older but related...here! But honestly, if you haven't heard of these things yet, and you're getting your current news from some girl in Siberia, you should...I don't know. Work on that. Thanks to people who point these awesome things out to me! The winds here have been very strange - changing direction frequently during the day, altering the temperature drastically. There's a fire to the northeast, bringing a thick coat of smoke when the wind is from the north - Siberian smog. With a sudden change in the wind, the tin roof shudders and threatens to flap off, in unseasonably strong winds. The wind and the smell of fire make me nervous, like an animal. I am restless. My Russian name is "Larisa", since the common nickname for Larisa is Lara, which is close to my name. You know, I’m glad I have the kind of life where I can frequently shift my priorities from “I wonder if anyone is going to read my blog today” to “I wonder if I’m going to break my leg and be eaten by a bear today.” Especially when those last two are indistinguishable. Leg breaking = bear eating. It puts things in perspective. Never fear, I have not broken anything recently, nor have I had any negative encounters with bears. What I did do is peak a Siberian mountain that was ridiculously difficult considering its frustratingly pathetic appearance. Before everyone starts saying “Psh, that’s nothing, you’ve never tried Mt. Killseveryone” I’ll have you know that I am a decently experienced hiker, throughout California’s significant mountains, so I’m going to go ahead and make a big drama about this trip despite the fact that no, I might not have tried Mt. Killseveryone and it may indeed be very much worse. So much for disclaimers. So there I was, staring up a thousand foot cliff of shards…oh wait, no, I was staring up a gentle green slope. But lets start at the beginning. Not exactly Kilimanjaro. I shouldn’t even embarrass mountains by calling it a “mountain”, it’s really more of a glorified hill. The top comes in at mere 580 or 620 meters (1700-1900 feet), depending on if you believe in a hand-held GPS or the Russian government. 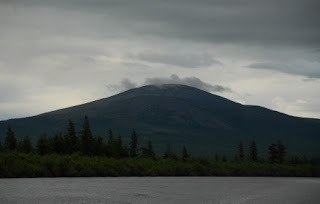 The mountain, local river branch, and nearby settlement are all called Panteleihka, or “Mountain River”. So if you say you’re going to Panteleihka, who knows what you mean. 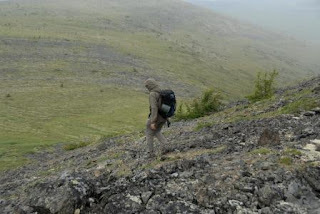 The day we went out was very cloudy and nice and cool, perfect for a little mountain climbing. 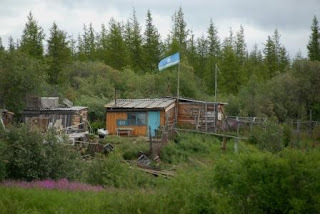 We landed at Penteleihka (the “village”, which around here defines anything between 1-10 buildings). 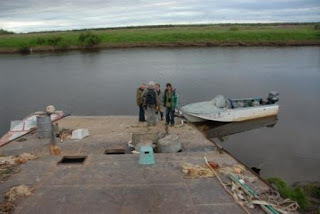 Our boat was docked to a huge half-sunk barge, embedded half on land and extending nearly to the center of the stream. The village appeared to be nearly deserted, which it nearly was. 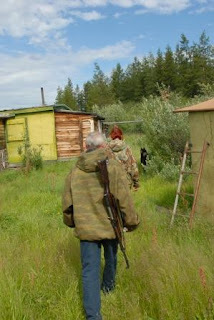 According to our guide (Sergei D) the village was very old, established around 360 years ago. Many of the buildings had been built by the Cossacks throughout that long period. 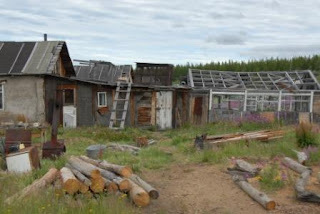 After the ravages of the end of the Soviet Union, the village had been mostly left to decay. During the summer, a few families live there for hunting and fishing, and during the winter only one or two people hang around for winter hunting. 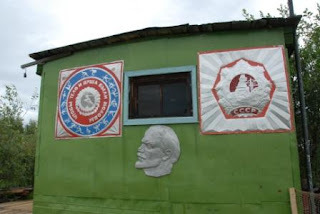 Sergei D led us to one of the summer families, who lived in a small green house adorned with metallic sheet posters depicting various Russian themes. I should mention that the mosquitoes were already going crazy over us, and I was very thankful for the cool weather which made wearing a hat and my faithful gloves bearable. So we met the family – a hunter who’s name I believe is Slava, and his wife Vera, and their teenaged son who’s name I couldn’t make out. 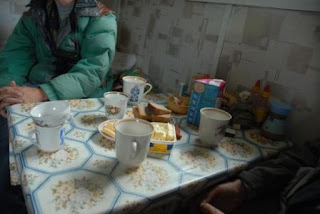 They live in Penteleihka (village) during the summer, and for the rest of the year they live in Cherskii where Vera is a math teacher at the school. Vera spoke a small amount of English, and we were invited inside for coffee. 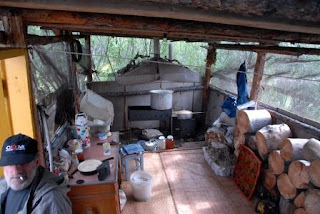 The house – a small single-room box shed attached to a screened-in outdoor kitchen – exemplified the extremely basic living conditions typical of the region. The two small beds doubled as seats for the table, which we were ceremoniously seated around and offered drinks and snacks. 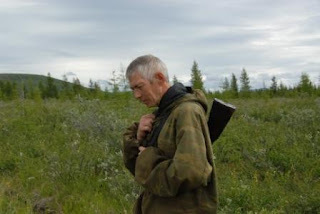 After this ever-awkward ritual – my god I wish I spoke more Russian – Sergei D announced that he would be leaving us now, and that the family would lead the birders and me to the base of the mountain path. 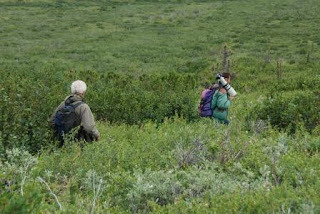 We set out through the forest, Vera and I leading the way with the Swiss birders, the son, and Slava coming behind with a rifle. Sergei explained that it was “very small chance that problem with bear” and I was perfectly inclined to believe him, knowing that the area only held usually harmless brown bears. 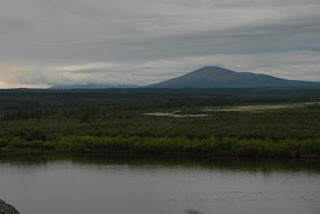 Only a about a hundred meters into the forest on a barely-discernable hunting path, we saw evidence of some of the larger mammals of this region – enormous moose tracks in the mud, literally big enough to twist an ankle in. As much as I would love to see some animals, the ever-thickening underbrush made me more worried about running headlong into a moose than a bear. At least I’m vaguely the size of a small brown bear. I might be able to take one on. A few minutes through the forest brought us to a plowed out road typical of the wilderness regions. 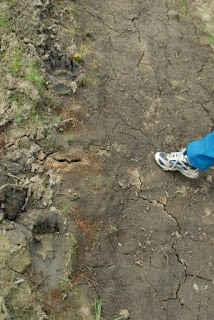 Repeated running of massive tractors over the frozen ground has permanently scarred the terrain with huge muddy ruts. There are some areas in permafrost regions where a single vehicle driven across the tundra leaves its tracks behind for decades (you can see many examples on Svalbard). This road was only drivable in the winter, when it freezes and snows over into a semi-level highway. 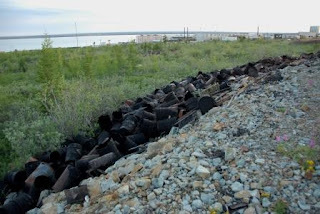 This “highway” led from Penteleihka (village) to the region’s electrical source – a nuclear power plant 300 km away. Everything was feeling pretty good, barring the marauding mosquitoes, and I had started up a basic form of communication with Vera, who seemed to have taken a particular interest in me, especially after her shocked discovery that I was only 22. 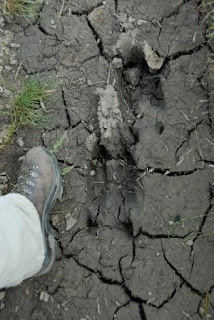 A few minutes down the road, I recognized a pair of massive, decently fresh bear tracks under my feet. They were certainly in the area. The journey continued, and the base of the mountain seemed to get no closer. 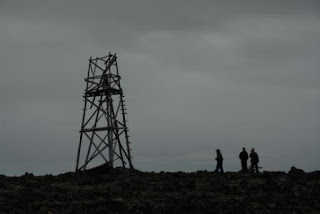 After branching off the road and following another small forest path, we were lead to a pile of old wooden boxes, which – if I interpreted the conversation correctly – were left from old geological expeditions a few hundred years ago. Interesting side note – I might not be able to speak Russian, but I’ve gotten pretty good at communication with the bare minimums of English and general gestures. 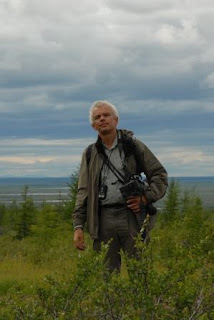 One of the birders spoke a bit of Russian, but I was amazed to find that when Slava and Vera couldn’t understand him they turned to me to interpret, and visa versa. And it usually worked. The Swiss birders by this point had seen a number of things to photograph, and the family seemed to be getting somewhat impatient. 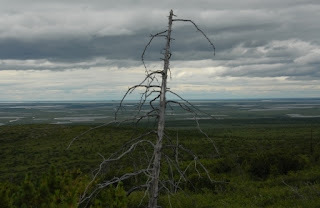 Once along the road again, it became clear that the rest of our journey would follow no road – we needed to branch off perpendicular from the path to head up a small saddle and hit the lower base of the mountain. Vera drew us a small map on the back of a box of matches (sweet, although completely unnecessary) and she and her family took off at speed up the mountain. Apparently they had decided, having come this far, to complete the peak themselves. The first low foothill seemed like a fun adventure. There was no path whatsoever to speak of, and we had to just force our way long the least vegetated areas. 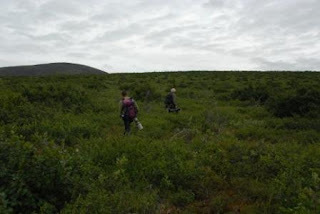 Luckily, it was a treeless area, so most of the plants were less than 2 meters tall and it was easy to keep track of each other. At the top of that ridge, we could see that there was another level of foothills to cross before truly reaching the base of Penteleihka. Things started being less fun. 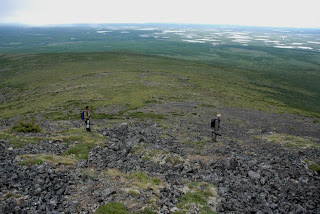 Although it was steadily up hill, it certainly wasn’t remotely steep, but the vegetation was fierce and the bugs worse. 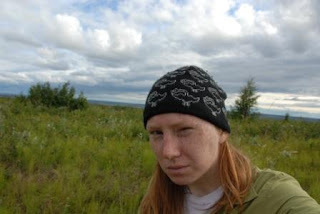 Before parting, Slava had indicated that I should take off my wool hat – something I was perfectly desperate to do already in the heat of hiking, but it helped keep the mosquitoes off my scalp and forehead. I preferred boiling to the itching insanity that I knew would come. As we got higher, I could smell the rain starting to fall in the distance, and it looked like it would take a few more hours to get near the mountain. Having come this far, we decided to go for it anyway. Well, to cut out some hours of slogging up the foothills, eventually we did indeed reach the base of the rocky mountain skree. At this point, having reached the rocky slopes, I was somewhere in between one birder and the other – one had gone ahead and started looking for the special bird, the other had fallen behind to photograph some birds on the foothill. My bad foot was starting to tell me that it was not happy with the situation, so I decided I had gone far enough, especially considering that we still had to hike home. So much for that! After a bit of a rest, the second birder caught up and asked about starting for the top. At my hesitation, he said “I’m Swiss! I have to go to the top!” Well I can’t turn down that kind of challenge, so up we started. The view was simply stunning the whole trip up. It wasn’t so hard, not too steep but threateningly rocky. 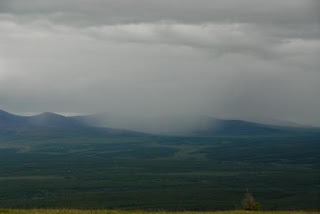 During our frequent rests we could see a huge rain storm slowly sweeping across the taiga – its so flat, its impossible to take in everything. Unfortunately for the birder, there were no birds at all in the rocks. 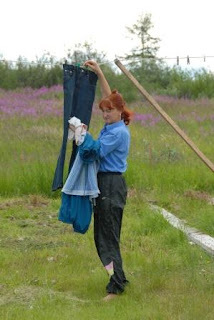 Fortunately, a heavy wind picked up to drag away the mosquitoes. 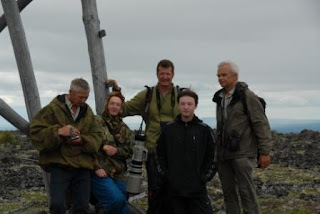 Once again to cut out some time of hiking, we finally reached the top, where we were greeted by Slava’s family. An old wooden observation tower was at the peak, which we all climbed up a few feet before getting terrified back down again by the rickety wood. Scads of photos were taken with every combination of camera and people. 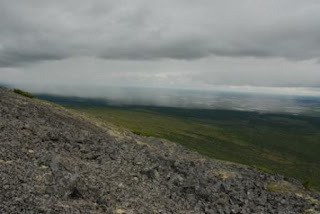 It was a wonderful feeling – the view was incredible, the rain was just starting to fall, and we had an awesome bonding experience with Slava, Vera, and son. Decently tired but ready to start the downhill trip back, we parted ways again – the family took the same eastern route down, while we decided to take a western route so the birders could check another side of the mountain. Hoo boy. Initially, this bought us down through a similar rocky skree as we came up through. We hit another saddle and starting walking on moss, which felt awesome to our tired legs after fighting to stay upright on the slippery slopes. In the distance we could see the road to get back to Penteleihka (village) and we plowed forward. At the base of the saddle, we entered a nightmare. 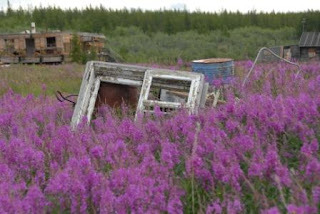 The vegetation got thicker and thicker, until we were plowing through shrubbery with no clearings in sight. For hours. Other than steep slopes, it was some of the worst possible hiking conditions have ever been in. It’s not like wading through grass – its like trying to walk through a solid hedge that your grumpy neighbor has installed to keep the kids out. 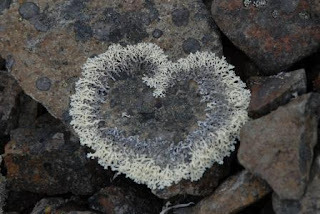 Except underneath you have absolutely no idea what you’re walking on – it might be moss, or a huge hole, or a pile of barely-balanced rocks. Or your legs can’t even break through the plants so you balance on a pile of spindly branches. And interspersed are thorny vines, huge clouds of bugs, and piles of mystery animal feces that clearly came from something very large. It’s vaguely comparable to wading through waist-high snow over unknown terrain…except you’re not going to freeze to death, I guess. And out here the distances are very deceiving. It was the never-ending hike of torture through this shrub land. At one point we started heading toward what looked like a clear area, only to find the ground beneath us turn to bog as we ran into a swamp. 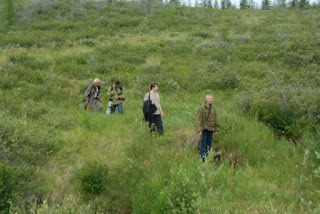 Heading back into the vegetation, I could only be thankful that there are no snakes in Siberia. I couldn’t see my feet, I could hardly see anything below my waist, and in the many, many times I fell down everything would disappear completely. Sometimes the others would fall, and it looked like some giant green hole had simply swallowed them entirely. By this point, the only thing running through my head was a string of increasingly nonsensical curses against the mountain, my feet, and everything within sight or thought. Finally we came across a very faint path through the brush – a very old branch of the road we were trying to reach. Although covered in vegetation, it allowed some small area that was easier to walk through. By this point I was exhausted. My bad leg had given up on me long ago and I could barely rely on it to stay balanced in the tricky terrain – I am frankly amazed that I didn’t end up breaking an ankle. All in all we got back to the road, which meant we only had another hour of hiking to go before getting back to the village. Let me tell you, I thought I was pretty tough but I have never been so close to my body absolutely refusing to follow orders. I hit the point where it hurt more to stop than to keep plodding on, then I hit the somewhat startling point of realizing that I couldn’t make my legs do what I wanted. They would go neither faster nor slower and progressed on autopilot. Despite the dire scenarios running through my head, we did make it back to the village, ending a 9-hour, 18 kilometer (about 7.5 miles) journey, smelling completely disgusting, covered in bug bites, and with aching feet. 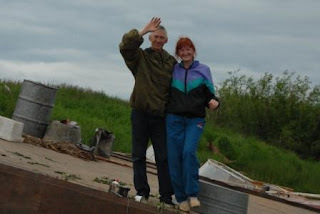 We were treated to a dinner of fish stew by Vera and Sergei D came to collect us. I fell asleep in the boat on the way home as it started to rain on me. All in all, a pretty awesome day! I guess that’s my sort of thing, as long as the leg-breaking and bear-eating doesn’t happen. Well, it seems pretty awesome now, after recovering from a sleepless night tormented by fingers stiff with mosquito bites and a cramping leg unused to strenuous demands for the past seven months. I found a copy of “Never Cry Wolf” by Farley Mowat in my cabin. Everyone needs to read this book. Forget the movie, read the book. It’s brilliant. While I only have a few interesting things happen in the typical course of a week, I tend to get behind in talking about them. Technically, here’s what’s actually happening in my life: the birders left today, leaving me the only visitor for the rest of my time here – a mere 2 weeks. I’ve gone on a few interesting walks recently, the photos from which I will share with you next time. If anyone knows of any awesome jobs, let me know because apparently I need to enter the real world soon. 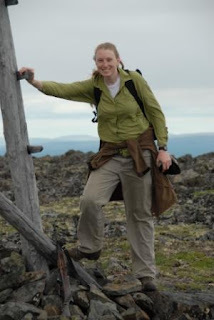 Laurel has a degree in the obscure yet utterly vital field of Science, Technology, and Society, but prefers to think of herself as a photographer- ecologist- journalist- healthcare researching- animal wrangler. 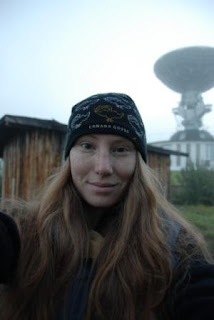 She spent one year living north of the Arctic Circle working on an epic photography project. All original material published on this website is copyright by the author/photographer (Laurel McFadden). All rights reserved.